WASHINGTON (AP) - President Donald Trump says he might give his refugee and immigration travel ban a second try, either as a revision or as a new order, as he contends with an appeals court ruling that prevents the ban from being enforced. Trump said he expected to win the legal battle over his original directive even though options were being considered by the White House. Advisers were debating the next step in response to the 9th U.S. Circuit Court of Appeals ruling that upheld a restraining order on the travel ban. The White House directive had suspended the nation's refugee program and barred all entries from seven Muslim-majority countries. A White House official initially suggested the administration would not ask the Supreme Court to overturn that order. But chief of staff Reince Priebus scrambled to clarify to reporters that "every single court option is on the table," including a high court appeal or "fighting out this case on the merits" in a lower court. Trump's executive order was hastily unveiled at the end of his first week in office. While the White House boasted that Trump was fulfilling a campaign promise to toughen vetting procedures for people coming from countries with terror ties, the order caused chaos at airports in the U.S. and sparked protests across the country. The president has cast the order as crucial for national security. Earlier Friday, he promised to take action "very rapidly" to protect the U.S. and its citizens in the wake of the appeals court decision, but he did not specify what steps he planned to take. 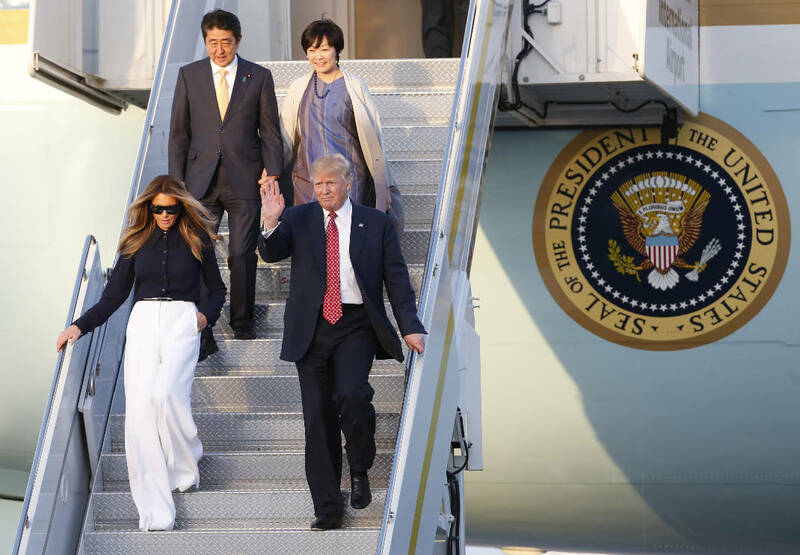 "We'll be doing things to continue to make our country safe," Trump pledged at a news conference with Japanese Prime Minister Shinzo Abe. "It will happen rapidly. We will not allow people into our country who are looking to do harm to our people." The president's comments were far more restrained than his angry reaction to last week's initial court ruling blocking the travel ban. Trump took aim at both the "so-called judge" in that case and the ruling, which he called "ridiculous." Trump continued to conjure images of unspecified danger Friday, saying he had "learned tremendous things that you could only learn, frankly, if you were in a certain position, namely president. And there are tremendous threats to our country. We will not allow that to happen, I can tell you that. We will not allow that to happen." Senate Minority Leader Chuck Schumer tweeted that Trump "ought to see the writing on the wall" and abandon the proposal. The New York Democrat called on the president to "roll up his sleeves" and come up with "a real, bipartisan plan to keep us safe." House Democratic leader Nancy Pelosi of California promised, "Democrats will continue to press for President Trump's dangerous and unconstitutional ban to be withdrawn." And Trump's former presidential rival Hillary Clinton offered a terse response on Twitter, noting the unanimous vote: "3-0." Congress' Republican leaders, House Speaker Paul Ryan and Senate Majority Leader Mitch McConnell, declined to comment. U.S. District Judge James Robart in Seattle issued the temporary restraining order halting the ban after Washington state and Minnesota sued, leading to the federal government's appeal. The Trump administration has said the seven nations - Iran, Iraq, Libya, Somalia, Sudan, Syria and Yemen - have raised terrorism concerns. The states have argued that the executive order unconstitutionally blocked entry based on religion and the travel ban harmed individuals, businesses and universities. Trump and his aides frequently refer to a ruling by a federal judge in Boston who declined last week to extend a temporary injunction against Trump's travel ban. In a separate federal ruling in Seattle, a different federal judge put the ban on hold nationwide; it is that judge's decision that the White House has challenged. "It's a decision that we'll win, in my opinion, very easily and, by the way, we won that decision in Boston," Trump said. Colvin reported from Palm Beach, Florida. Associated Press writers Ken Thomas and Darlene Superville contributed to this report.